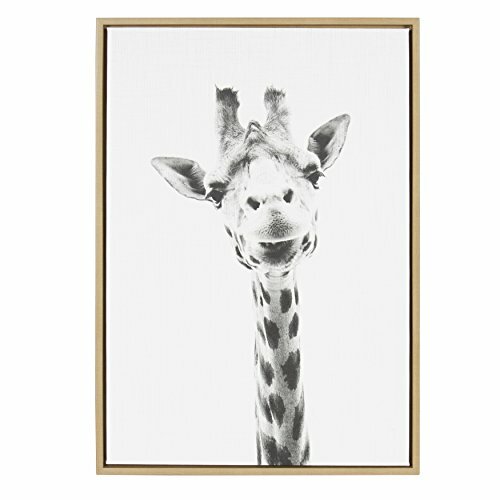 Bring the beauty of nature in its pure form and display your love of animals in your home with this striking giraffe portrait. Printed and framed in the USA in Waunakee, Wisconsin, this framed floating canvas art will be a pleasure to look at every day in your living room, bedroom, nursery, or any room in the home. Printed on gallery wrapped canvas and framed with a natural light woodgrain polystyrene frame, this animal wall art has two hangers already attached to the natural wood colored MDF back for easy wall display. The outer dimensions are 33 inches tall by 23 inches wide by 1.6 inches deep. Artist Biography: Simon Te (Russia) is a new artist, just getting his start 2 years ago. He is a self taught photographer and graphic designer. It's been very hard work, but he has come a long way with tutorials and practice. Simon draws inspiration from contemporary art and the freedom of expression. He likes the simplicity of lines and forms created by nature itself. Simon is anticipating an exciting future ahead.